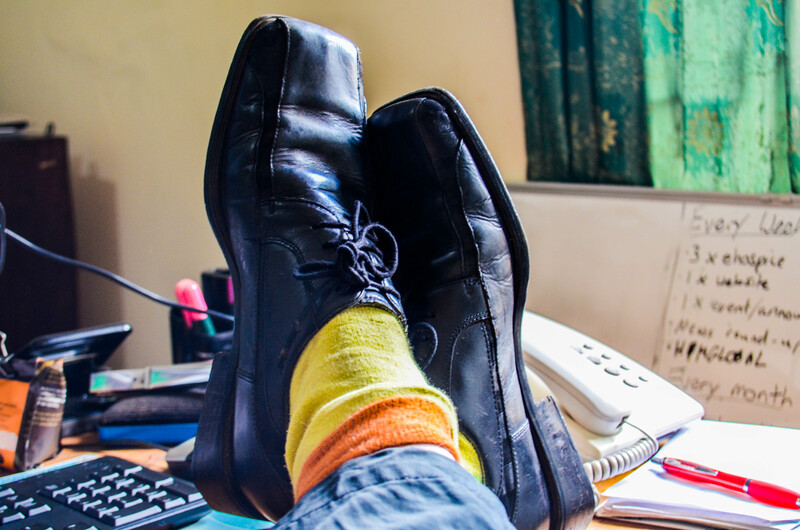 My socks… read into them what you will. A friend of mine and an all-round nice guy, Mr Andrew Lansley, has just started a fashion blog called ‘Averagely Dressed Male’. Starting September 1st 2014 I will document what I wear every day for a year. The only problem is I have no concept of fashion and despise shopping for clothes. It is, I thought, a nice concept and a counter balance to the media narrative that we must all worry and be judged by what we wear. Andrew will be showing us, day in day out, what he happens to be putting on that day whilst at the same time asking himself some pertinent questions around his clothing choices. My initial reaction to the blog was one of immediate solidarity. I am someone with close to no fashion sense and who, quite frankly my dear, couldn’t give a damn what I look like. This feeling was confirmed when I saw him post a picture of a rather rancid pair of boxer shorts with rips in…. Boxer shorts with rips in that also just happened to look almost identical to a few pairs I own. 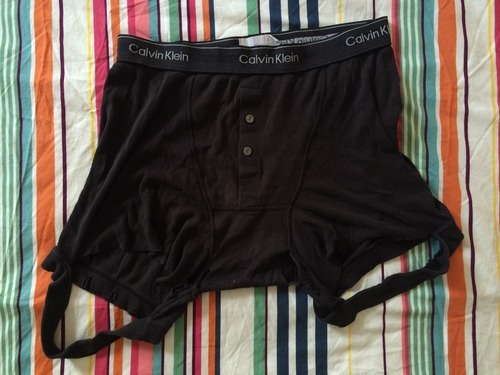 Andrew’s boxers (pants) – not mine! That said, his post made me reflect on my fashion/clothing choices. Whether I like to admit it to myself or not, I guess I do have a style of sorts and this style is one of pretty boring conformity. This realisation alarmed me slightly. Anyone who knows me can testify, conformity is not something that sits easily with my personality. As such I started thinking. How did I end up wearing such utterly boring clothes? My rule to fashion and clothing in general is a simple one: clothing (and/or fashion) should be there to enhance your chosen life-style not limit it. For some (certainly not me) this might mean taking joy out of following the latest fashions from around the world and being the first to bring that style to the high street. For others (a bit more me) this might mean buying the latest outdoors clothing to be able to perform at a particular sport better. For me though my day to day clothing choice is more often a negative choice. Essentially my day to day clothes are whatever I can get my hands on for free or very cheap that enable me to function as part of everyday society. I don’t really care what I look like, but I don’t want what I look like to limit my interactions with people. When people are looking at your t-shirt rather than listening to what you’re saying, the chances are your fashion choice has fallen foul of my basic rule – it is limiting your life not enhancing it. In this sense, I wear a shirt to work because people would frown upon me if I didn’t. Outside of work though I tend to wear shorts, t-shirts (often free) and flip flops because most people I hang around with are friends and don’t judge me (too harshly) on what I wear. This approach is in many ways an anti-subculture attitude to fashion. What I wear and what I look like really doesn’t define me. While I take pride in my actions and words, my clothes are there as a slightly unavoidable extra in my life. Others that I politically or socially identify with in contrast will go to great lengths to ensure their image defines them. While many people that I call friends use their image to fit with their perspectives on life, I tend to let my life mould my image. At a job interview/wedding/funeral you will normally find me in a suit. Up a mountain you will normally find me in outdoors gear. At a house party you will normally find me in the before mentioned t-shirt, shorts and flips flops. I want to be comfy, I don’t want to be judged, but I’m not too bothered if I am slightly uncomfy or if you judge me a little bit. As long as we can still be friends, I’m easy! At an initial glance the flip side to this is that my fashion sense (or lack of) is driven by conformity. But, after thinking about it I also think something slightly more subtle is going on. To start with most of my clothes come from charity shops in the UK. My clothes are purchased whilst supporting good causes (even if I am not passionate about animal welfare you can’t really begrudge giving a dogs home one quid in exchange for a t-shirt). It turns a de facto necessity (being clothed) from something that perpetuates a global system of inequality and materialism into one that supports circular product-systems and a form of charitable giving. This is a double win in my mind. It is, in this sense that my fashion clothing decisions are a sub-conscious (I never actively decided to reject high street shops and do still sometimes venture into them out of necessity) rejection of the mainstream conceptions of fashion. In one sense I often look like an image of conformity, in another sense I reject the whole notion of materialism, fashion and consumerism. This combined with a slightly ‘don’t actually care that much’ attitude sometimes peeks through in my not always on the mark fashion decisions. I fully support Andrew’s ‘Averagely Dressed Male’ blog idea. I think there are lots of issues to be discussed – even by those, including myself, who initially reject the idea of fashion. We are all in one way or another products of our surroundings and trying to understand how those who fit outside the media driven narrative of fashion fit into those surroundings is an admirable one. Roll on September when his fashion blog starts for proper. Most of the time I work with very similar ‘does it let me do the stuff I want to do’ philosophy. For work purposes I tend to dress steampunk (how awesome is my job? truly awesome) and I seem to be succumbing to the Stroud effect and looking more like a hippy in my ‘normal’ attire. Fabric re-use tends that way too….